Home Columns Can Lunken Last? Actually, I didn’t know. Nor did I instinctively think of “airport hangars” and “historically significant” as a natural coupling. But I was intrigued. Despite the fine architectural details in the terminal, it looks tired. The letter “A” is missing from the “Wilmer Avenue” sign over the entrance. The interior is dim, and the stairways to the second story, where an embryonic aviation museum is taking shape, are dingy. The front windows, which are still hand-cranked, remain open in the summer because air conditioning has never been installed. As you walk in, a thrown-together office intrudes on the already limited lobby space. I called Fred Anderton, the genial airport manager, in hopes of learning whether the deterioration is serious or superficial, and in either case, what are the chances of arresting it? Sixty years ago, Lunken Airport was hardly new, but the vision of its founders—to be the city’s primary municipal airport—was no longer viable. Developed in the 1920s by Edmund H. Lunken and his son, Eshelby, who jointly recognized the potential of aviation, the airport grew out of a 230-acre gift of land that they signed over to the city. Cincinnati then purchased another 870 acres, and by 1930, due to the size of its concrete runways, Lunken was the largest commercial airport in the United States. Its earliest significant tenant, the Embry-Riddle Company, was both a regular airmail carrier and one of the nation’s first flight schools approved under the Air Commerce Act of 1926. In 1932, following ownership changes, Embry-Riddle moved to St. Louis and was consolidated into two-year-old American Airways, soon to be re-launched as American Airlines. While it is not true, then, that American Airlines “got its start” in Cincinnati, it was a major carrier at Lunken for many years. Other famous names that made landings at the field in those early years included Charles Lindbergh, who stopped here in August 1927 on a tour of all 48 states. Only three months past his storied trans-Atlantic flight, he generated enough excitement to help the city pass a $500,000 bond issue to expand and upgrade the facility into a genuine municipal airport. Two years later, following the first Women’s Air Derby, doomed aviatrix Amelia Earhart made a cameo appearance. 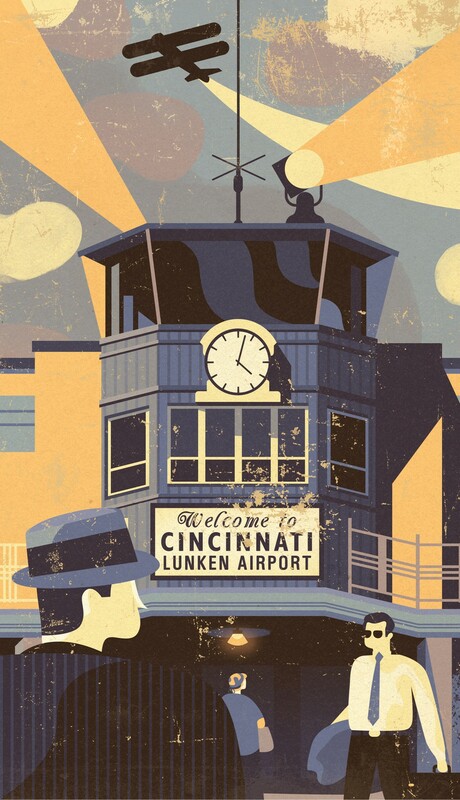 When the “new” Lunken Airport was officially dedicated in 1930, more than 25,000 people attended a three-day celebration, highlighted by stunt flyers, air racers, and aerobatic daredevil Jimmy Doolittle. Handing out the trophies were Howard Hughes, then a 24-year-old aircraft manufacturer, pilot, and movie producer, along with his recent discovery, Jean Harlow. The excitement—and one surmises, the high hopes—soon yielded to reality. Topographically, Lunken was a loser. Intermittent flooding and blankets of fog, not to mention its hemmed-in location, revealed its inadequacies almost in inverse proportion to the nation’s growing awareness of what modern airports, and larger airplanes, would require. No sooner had construction been completed on the new terminal than the 1937 floodwaters rose almost to the base of the control tower (a tiny brass marker in the brick facade just below the tower commemorates the disaster). For 17 days, flights were canceled. Once recovered, and despite misgivings, the airport expanded—a radio-operated control tower came on stream; both TWA and Delta initiated service—and during World War II it averaged 11,000 operations monthly. But with the war’s end, the federal government refused to put any more money into a facility with so many limitations. Northern Kentucky, which had been developing a military field in Boone County since 1942, stepped into the breach. By 1947, the commercial airlines had moved across the river, and the Greater Cincinnati and Northern Kentucky International Airport was a reality. Yet the airport at Kellogg and Wilmer—“Sunken Lunken” as it had come to be known—did not go away. Quickly establishing itself as the regional seat of general aviation (a.k.a. business and private air travel), it grew steadily in its new role from the early 1950s to the present. Of particular help was the construction of a new, jet-worthy runway on the north side of the field. To build it, airport authorities had to re-route a bend in the Little Miami River; now it parallels the longest portion of the bike path around the airport. Currently, Anderton says, there are some 60 terminals housing many, if not all, of the region’s major businesses: Procter & Gamble, Macy’s, Kroger, American Financial, and Cintas among them. More recently, the arrival of Ultimate Air Shuttle, offering efficient service to New York City, Chicago, and Charlotte on weekdays, has re-introduced a modicum of commercial-like operations. Not surprisingly, the first order of business for Anderton, the City of Cincinnati, and the FAA is to sustain Lunken’s reputation as a splendid general aviation facility. The hangars, the control tower (a new one, completed in the early ’60s), the runways, and the infrastructure pertaining to each are what gets attention. Not the terminal. And not the three “historic” hangars. Walking me through the terminal, Anderton said three things are likely to happen in the near future. The parking spaces at the entrance will be removed; they are too close to Wilmer Avenue, and three times a day, he says, he hears the screech of brakes as someone is backing out and someone else has to make a sudden stop. That improvement would have the additional benefit of moving the bike trail away from the terminal’s front door. Right now, bikers and joggers use the terminal as a meeting space, and their wear-and-tear is considerable. Second, Anderton plans to bring in a consultant for a “freshening up” of the popular Sky Galley restaurant. Food service has been an asset of the airport since its earliest days—the original Sky Galley provided some of the nation’s first airplane meals—and Anderton wants to preserve that attraction. Finally, he said, he hopes to introduce central heating and air. Of the three original hangars, Anderton believes only No. 1, where the American Airlines offices were once housed, has aesthetic value. In bas-reliefs on its three bricked sides are intricate designs of interlocking airplanes—small touches of ornamentation on a mostly utilitarian building, but in their way emblematic of what the original Lunken architecture is all about. It isn’t grand, it isn’t dramatic, but it is a distinctive link to our recently vanished past, and people who care about such things will be endlessly enriched by its survival. Anderton knows this. His “desire to preserve history” signals his intention to do so, one way or another. We should all be cheering for him. The weekend after I talked with Anderton, I returned to Wilmer Avenue for Lunken Airport Days, an annual celebration, in September, of all things aerial. Among many attractions were displays of model aircraft in the terminal, World War II airplanes from the Tri-State Warbird Museum in Clermont County, private jets available for viewing, helicopter rides, and a presentation of the colors at noon. Hundreds of people, many with children in strollers, swarmed through the terminal and out onto the tarmac. All aviation buffs to some degree, they were eating the free hot dogs supplied by Kroger and a plutocratic few, I gathered, were considering the $450 price tag for a 30-minute ride in a vintage B-17. So how did they feel about the airport? So, no, in the big picture, a refurbished terminal is not the most important thing Fred Anderton has on his plate. His priorities are in order. But give him a few extra dollars, and the results could be stunning. It could give Lunken Airport Days new meaning for us all.